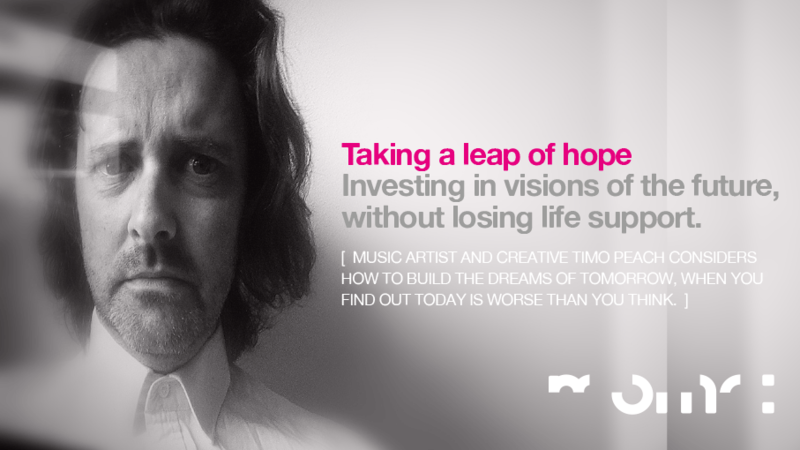 Investing in visions of the future, without losing life support. This was a talk in two rather different formats to two rather different audiences I was lucky enough to be asked to share on the same week. A week after my first ever pilgrimage to Ibiza, bobbing around a villa’s pool reading mind boggling worries about tomorrow, while listening to youthful 90s rave. Twelve months on, and being asked back – this time to the pop-up party between the two inspiring days of SB7 – I didn’t feel I quite wanted to share the same thing again. Not because it isn’t a still neatly relevant thing – I don’t mind saying this, because Lord knows I worked on the bleedin’ thing – but because it just felt like it would be a missed opportunity. But as I stretched out in an odd late return to summer, fleeing the UK autumn for our inaugural visit to the white isle, I really didn’t have a clue what the hell I was going to talk about one week later. It was interesting, however, to spend that week putting off looking forward by joining two of our oldest mates in all-night clubbing for the first time, finally doing something we were supposed to have done twenty years ago. No one tells you. Ibiza isn’t white – it’s green. Forested and fertile looking. And a lot more civilised than the First Aid-equipped youth leader in you is psyching for. As a dedicated electronic music lover and explorer, I have loved club music for most of my adult life, without ever having visited the party lightning rod for that end of the scene. I mean, sure, when Acid House first appeared when I was at art college, it was largely just annoying – so bashingly unmusical was it to my young ears. And in those days, it was all about Chicago. Which sounded sort of cool, but not desperately of a cultural mind with Bournemouth. But as the whole scene developed to slowly annexe electronic music’s very title, and prove itself as a whole new sonic movement, it didn’t simply grow more musical and adventurous, it began to develop the great idea of doing dancefloor stuff somewhere you’d actually want to go on holiday. >taps forehead< That, I get. I can remember where I was when I first heard Café Del Mar vol Cuarto. I was on a boat off the Whitsundays on the other half of the world in the late 90s. And it just sort of soaked into me. I bought it at exorbitant cost in Singapore as an import, right before flying back to Europe where it was made. Still have that same CD edition and it comes out every summer. It IS the sound of summer in our house; a strangely perfect mix of atmosphere and soul, chilled down to just below the Get Excited line, and warmed to just above the Crap Pool Musak line, in the sweet spot where you can swing in your hammock in a sort of blissful trance. It’s oddly an all-time favourite record of mine. I know yours is an obsure Bowie record but you must remember I am an absolute slave to lifestyle. What I’d never actually done was get out of my mental hammock and go to the heartland of half the records I would love endlessly at circuits classes and on summer vaykays and in Friday kitchen raves. So it was overdue. And going with my oldest mate Mikey, the bloke I’d all but begun my musical explorations with as young teens huddled around his dad’s rather nice turntable, was a perfect bit of cultural closure. He and Emma and the lovely first lady of Momo and I have been blasting dance music and weird beats through each other’s kitchens for decades, untempted to swap a half decent glass of Co-Op red and a sit down over chille for queuing for the toilets and tiptoeing through pavement pizza. We’d also not actually been away together in twenty years and I’m pretty sure I remember it not involving a private pool and a fridge full of white Rioja. It involved sheep droppings, I do recall. Now, I’m not a big one for looking backwards. I naturally carry a personal heritage with me everywhere, rather nicely, that includes enjoying certain records at certain times and appreciating good memories and all that. But I like to look forward. So it was, in one sense at least, a bit odd feeling to go to somewhere that had its heyday when I was a much hipper sounding demographic than I am now. And that’s partly because we weren’t the oldest buggers there. Not by a long shot. You’d think that being old enough to be most clubbers’ parents would have made us feel old. But Ibiza is full of old ravers who look like they simply never got around to leaving. And this mostly just helps to make the place feel friendly; people in Es Paradis, the night we carbed up to cope with a ’till-dawn club experience, were mostly there… to dance. Men, women, youngsters, oldsters – all looked like they were just loving the beats. Like they’d remembered the point of a dance floor or a music festival – the music. It was nice. It felt nice. We made it until half five and felt that that counted. But it also sounded a small note inside me of a life road not taken. And that I am on another one. I mean, don’t get me wrong, I’m with Mikey when he turned to me about 24 hours into the whole holiday and said simply: “This doesn’t feel like a last hurrah, it feels like an exploratory mission into a whole new way of life.” But the beautiful Balierics do make you think about a wider lifestyle, as the balmy winds blow off the Med and rustle the pines on the honey coloured cliffs, high above the inky rich waves. And so it made me think about why we want to look backwards. To simpler personal times, to simpler human times; there’s something in us all that wants to do it. Including me, sitting there as I was in the experience of a ‘personal pilgrimage’ to something of my own heritage, something linked to the music that has partly helped me to become me. While reading Yuval Noah Harari’s fearsome Homo Deus: A brief history of tomorrow, listening endlessly to Nick Chicane’s Sunsets podcasts, sipping G&Ts, surrounded by nature. Wondering how soon the decoupling of intelligence from consciousness will see us all whisked to robot-gaurded compounds in post-EU middle England. Heritage. Funny word, it turns out. I think of it as vaguely noble and interesting, linked to personal identity. Some others think it means fusty old crap we should demolish. I suspect the wit to identify the difference in any case is rather important. By some fluke, I had been asked to speak somewhere else the next week, besides the jaunt across Canvas’ stage that was looming – Bournemouth Borough Council. I had met economic development leader, Chris Shepherd, over a coffee earlier in the year and he got in touch again out of the blue in the summer to ask if I would bring something to one of his new Lunchtime Sessions. Obviously I got subsumed by various dead creative things somewhen after that and Chris had to politely come back to me and ask if I was ever going to let him know what the hell I was going to be saying with his name against it. Which wasn’t at all how he said it. But in a sort of sudden head rush I found myself sending him something rash about how to turn around the hopelessness of the entire world. Or something. And I say I’m not qualified. Well this meant I had to write it now, of course. So I did. And had a story arc for it worked out before leaving on a CO2 amplifier for the sun. But with forty minutes to fill, I knew I had a nice amount of time to piddle about with getting to some semblance of a point. If I was to give into the gnawing temptation to rework the same thoughts from three quarters of an hour into just 400 seconds and 20 simple slides, I would have to be sure any ideas lurking in my thoughts would survive intact after not so much amputating a limb or two of the talk but amputating the talk and keeping a few of its fingers. What caught my imagination, swirling as it is with so many things of this ilk currently, was the idea that what echoes backwards in us, reflects forwards. That heritage isn’t so much a simple history thing, as an identity thing – which means a brand thing, in marketing terms. Which means a vision thing. If you know where you’ve come from strongly enough, you’ll know who you are. And if you know who you are, you’ll know what your values are, your ambitions and hopes. And I’ve long worked as though such principles apply to organisations, groups of people, as well as individuals. So much, in fact, that groups of people work or fail according to how well they grasp their own sense of vision together – which is built significantly on who they think they are together. I admit that I would be the member of the gang making the club badges and designing the Power Rangers outfits for everyone at this point, but maybe that’s why I’ve spent so much of my time working across some odd combination of brand development and showbiz. At a time such as the one in which I’m writing, where all our old assumptions are beginning to sag, and tear and wear through, I know a lot of people are wondering just what costume they should be donning next. But it’s my belief looking around me that it’s about something a lot deeper than a bit of distracting entertainment. Holidays and showbiz both give us glimpses at other worlds, but I can sense us wanting more together. But right there, amid the economic reality of a popular spot that always threatens to kill the thing you love by flying you to it in a package deal, there was a moment. As the sun’s last finger let go of the horizon, everone assembled put their hands together and cheered. It gets to me again now, as I think of it. Everyone cheered and clapped the sun. They said thankyou. Partly to the DJ and to Thomas Newman who between them seemed to stage managed the sunset better than God, but even so – there it was. A supremely human moment. Something ancient and instinctive between strangers. And I found myself wondering, if we all took the reverent moment to applaud the sun every day, how might it change our relationship with the world around us? Including each other. I suspect it would feel like turning the life support back on, after feeling it slowly failing for years. Feel free to read the full original presentation by downloading the PDF, Taking A Leap Of Hope – BBC Lunchtime Session Sept17 right here >.